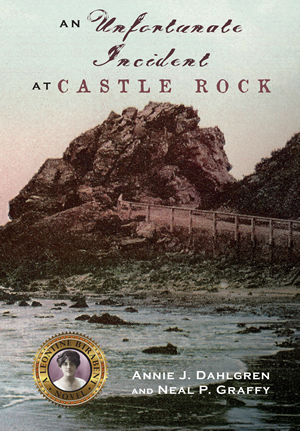 When Leontine’s young friend, eleven-year-old Patrick Denman, makes a grisly discovery at Castle Rock, a popular recreation spot on the Santa Barbara shoreline, he, along with Leontine and her tenant and friend Daisy Merrie, do their best to unravel what happened on the beach, and what it might have to do with the revolutionary new technology under development in Hope Ranch. The second installment of the popular “Santa Barbara History Mysteries” series, featuring actual early 20th century Santa Barbara resident, Leontine Birabent. 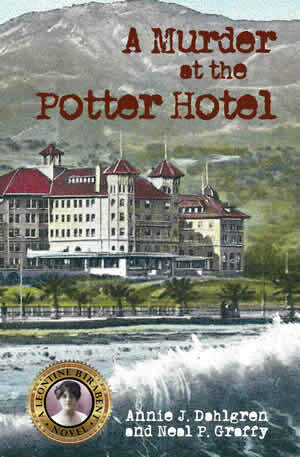 More than anything, A Murder at the Potter Hotel is about a time and place - Santa Barbara, California in 1908. That year saw the arrival of the Great White Fleet, having been selected as one stop on the global mission of good will. Joining the community in city-wide celebration, piano teacher Leontine Birabent, her young friend Patrick and Daisy, her tenant, are unwittingly drawn into a web of corporate crime and military deception that ends with someone dead. Though far from detectives, the three are, nevertheless, in the best position to determine who might be responsible – hopefully before the ships sail on. It may look like Santa Barbara’s red-tiled roofs and white stucco walls and buildings have been here forever... but who knows what secrets lurk beneath those facades? 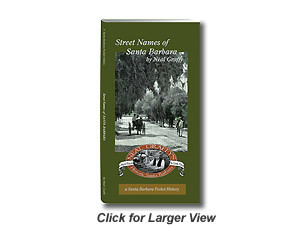 Santa Barbara historian Neal Graffy does! And through the images and text of Santa Barbara Then and Now, layers of time are peeled back to reveal an earlier Santa Barbara of many different designs and uses. This is the only book that dares to pose the question "Has every building in Santa Barbara been a restaurant at least once?" is 160 pages in full color. In 1851 the Town Council of Santa Barbara appointed a committee to apply names to the fifty-two new streets being created from “the front of the Mission Gardens to the sea and from hill to hill on each side” as a result of the survey of Salisbury Haley. 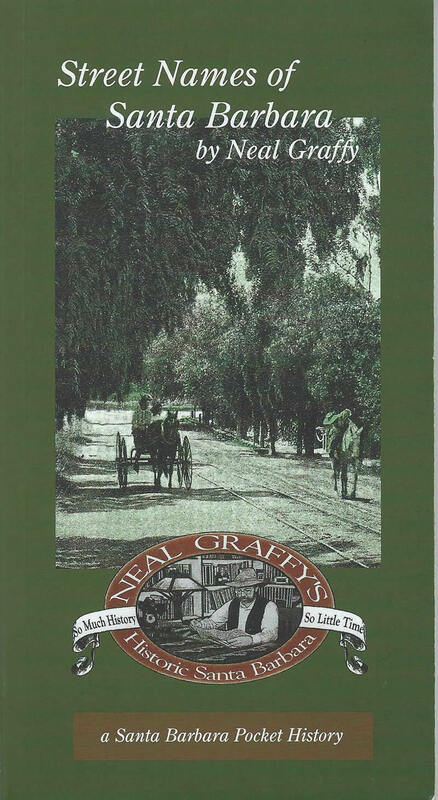 Unlike other towns whose streets bore the unimaginative A - Z, numbers, trees or names of presidents, they gave names to our streets that portrayed the geography and botany of our town, honored the Chumash, early settlers, governors, and showed a distinct sense of humor and in some cases, delightful sarcasm. 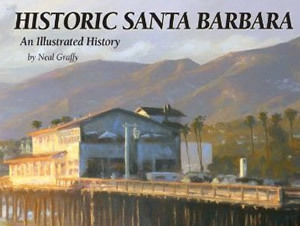 Historic Santa Barbara is a coffee table size book written for the Santa Barbara Historical Museum. It’s chock full of photos and text covering the history of Santa Barbara from the original inhabitants, the Chumash Indians, all the way up through the devastating Jesusita fire of 2009. The second half of the book profiles a number of Santa Barbara businesses, churches and non-profits.